More than 1.7 million children under the age of 5 die each year due to the effects of living in polluted environments, according to the World Health Organization (WHO). In a report released Monday, WHO found more than 1 in 4 deaths of children between the ages of 1 month and 5 years old worldwide result from pollution problems including second-hand smoke, dirty water, poor sanitation, inadequate hygiene, and indoor and outdoor air pollution. The report, entitled “Inheriting a Sustainable World: Atlas on Children’s Health and the Environment,” analyses common causes of death among children across the world, including diarrhea, asthma and other respiratory illnesses, malaria and pneumonia, and their connections to polluted environments. The report said the problems can start as early as inside a mother’s womb, but these potentially deadly health issues are preventable. 570,000 children under 5 die each year from respiratory infections, such as pneumonia, due to indoor and outdoor air pollution and second-hand smoke. 361,000 children under 5 die each year due to diarrhea resulting from lack of access to clean water, and poor sanitation and hygiene. 270,000 children worldwide die each before they reach one month old. 200,000 childhood deaths from malaria could be prevented with better sanitation and mosquito-control measures. 200,000 children under age 5 die from unintentional injuries attributable to hazardous environments, including poisonings, falls and drowning. “These are issues that I’ve been aware of for a very long time,” Dr. Lynn R. Goldman, the Michael and Lori Milken Dean of Public Health at the Milken Institute School of Public Health at The George Washington University, told CBS News. She said pollution and the related child deaths go hand-in-hand with poverty. Water sanitation, air pollution and malaria (spread by mosquitoes that breed in stagnant water) in particular are problems that we know how to solve. “Countries that have high rates of child mortality have a demonstrably lower pace development and economic improvement across the board. While addressing poverty they would also address the environment – that’s something a lot of people don’t understand,” Goldman said, explaining that many leaders think addressing environmental issues slows industry and development. “A lot of people think environmental protection hurt the economy, but I’m making the argument that it doesn’t,” she added. “This atlas focused a lot on death and that’s extremely important, but there are many children who have these problems and don’t die and end up with chronic diseases for life – asthma, the stunting of growth, neurological problems – lifelong chronic diseases that can change their entire prospects for life and adversely impact their intellectual development,” said Goldman. The WHO report cites China’s dangerously high average concentrations of fine particulate matter – air pollution particles small enough to enter the bloodstream through the lungs. 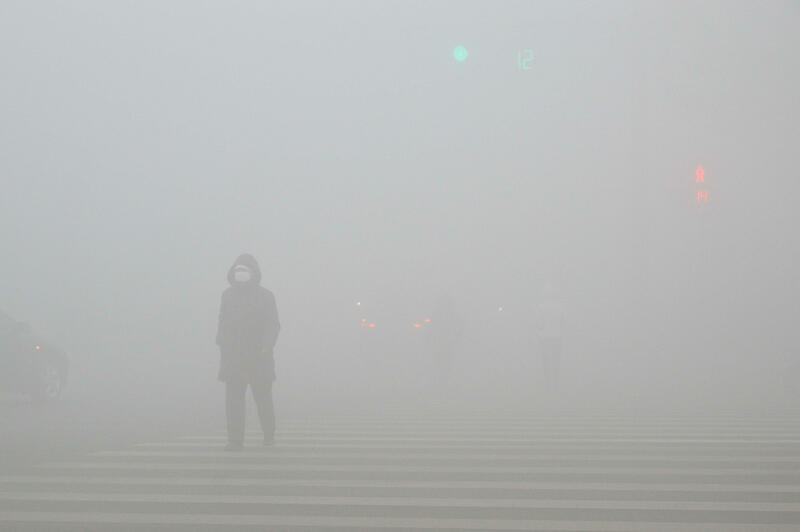 Urban areas of China average 61.83 micrograms per cubic meter of air, compared to 8.51 in the United States. Although many Americans still live in areas affected by high pollution levels, the United States overall is doing better than many countries when it comes to water and air pollution, and states such as California have made successful efforts in recent decades to reduce smog, Goldman said. Another major health concern cited in the report is the amount of toxins children are exposed to from the growing problem of electronic waste from mobile phones and other discarded devices – which can contain chemicals linked lower IQs, attention deficits, lung damage and cancer. WHO noted that electronic and electrical waste is expected to increase by 19 percent between 2014 and 2018. “Although e-waste can be safely recycled, much is not and is shipped from high-income to lower income countries, where it is either put in landfill or dismantled, often under hazardous conditions, exposing many workers, children and pregnant women to highly dangerous chemicals and serious injury,” the WHO report states. Fluoride, lead and mercury pesticides, organic pollutants and other chemicals in manufactured goods also have been found in foods and home furnishings, for example, where children are exposed. Worldwide, 11 to 14 percent of children aged five and up have asthma symptoms and about 44 percent are linked to the environment – air pollution, second-hand tobacco smoke, mold and poor environmental living conditions. Dirty fuels, because they rely on dung or coal, are used to heat and cook in homes in some parts of the world, yet they increase the risk of diarrhea and pneumonia. “Many issues for adults are far more serious for children. When they’re young, their immune systems are still developing,” Goldman said. Improvements in housing, schools, health facilities, urban planning, transportation, agriculture and industry could make a huge impact, according to WHO. “Investing in the removal of environmental risks to health, such as improving water quality or using cleaner fuels, will result in massive health benefits,” Dr. Maria Neira, director of WHO’s Department of Public Health, Environmental and Social Determinants of Health, said in a statement. “I hope this report will bring attention to these issues and also help people understand that when they’re making decisions about air and water and persistent pollutants that they think first about the children,” Goldman said.